The SanDisk Extreme PRO CompactFlash Memory Card is the world's first high-capacity card that supports VPG-65, the Video Performance Guarantee specification that ensures smooth 4K video recording as well as Full HD**4K (4096x2160) and Full HD (1920x1080) video support may vary based on host device, file attributes and other factors. See www.sandisk.com/HD. 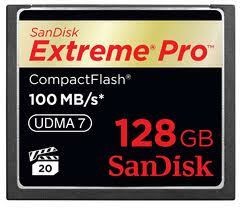 Professionals who need the highest video-capture endurance will find the performance they need in this memory card. Optimized for 4K video capture, the SanDisk Extreme PRO CompactFlash Memory Card delivers a minimum sustained write speed of 65MB/s with an industry-leading shot speed of up to 150MB/s for 16GB - 128GB cards and up to 140MB/s for the 256GB card**256GB: Up to 160MB/s read speed; up to 140MB/s write speed. 16GB-128GB: Up to 160MB/s read speed; Up to 150MB/s write speed. Based on internal testing; performance may vary depending upon host device. 1MB=1,000,000 bytes. X = 150KB/sec.. And with transfer speeds of up to 160MB/s, it makes it easy to move even large files for storage and editing. This memory card is also UDMA 7 enabled. The SanDisk Extreme PRO CompactFlash Memory Card can operate in temperatures ranging from -13?F (-25?C) to 185?F (85?C), so you can record rich Full HD video or snap the perfect shot in almost any climate. These cards are tested with rigorous stress, shock, and vibration procedures and feature RTV silicone coating for added protection against shock and vibration. The SanDisk Extreme PRO CompactFlash Memory Card comes with a one-year subscription of RescuePRO? recovery software**Registration required. Terms and conditions apply.. RescuePRO software makes it easy to recover deleted photos or videos and save them to your computer's hard drive--even if the files were deleted months ago.